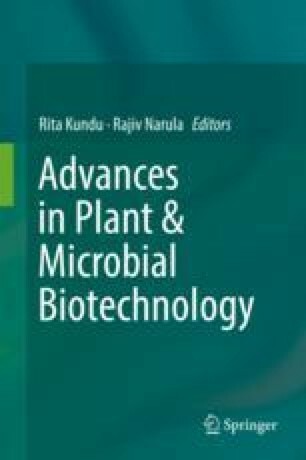 Naturally occurring bacteria were isolated from the internal tissues of stalks as well as from roots of sugarcane crop and from the rhizospheric soil. The highest numbers of bacterial populations were isolated from the rhizospheric zone. Isolated bacterial strains were subjected to antagonistic activity in vitro against Colletotrichum falcatum fungus causing red rot disease in sugarcane crop. Most of the isolated bacteria showed antagonistic activity against C. falcatum in vitro. Isolated antifungal isolates were identified morphologically and biochemically. Further, the potential strains were examined for various plant growth promoting traits and hydrolytic enzymes production. Bacteria isolated from rhizospheric as well as from endophytic zone of sugarcane crop showed the inhibition of red rot pathogen as well showed the in vitro plant growth promotory traits. Thus, isolates help in biocontrol of red rot as well as can be used for increment of sugarcane yield. The authors acknowledge Dr. Ram Ji Lal, Prinicipal Scientist (now retired) and Dr. Dinesh Singh (Principal Scientist), IISR, Lucknow for providing various assistance.